"Super quick prep and your family will love it! My children are dairy-intolerant; I have found that coconut milk is an excellent substitute for milk and cream and gives any dish a wonderful flavor. This recipe is gluten-free and dairy-free. It is also wonderful served over rice." 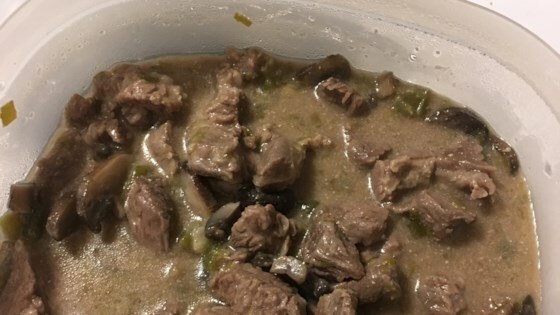 Combine coconut milk, beef broth, portobello mushrooms, green bell pepper, onion, and sea salt in a 9x13-inch casserole dish; mix well. Add beef tips; stir until well-coated. Bake in the preheated oven until beef is tender and sauce has thickened, about 1 hour. Bring a large pot of lightly salted water to a boil. Cook linguine at a boil until tender yet firm to the bite, about 11 minutes; drain. Serve beef tips and sauce over pasta. If you prefer thicker sauces, add 1/4 cup instant tapioca (such as Kraft® Minute® Tapioca) in step 2. It was great and I will make it again. Very good and so easy. I added a little arrowroot powder at the end to thicken it up some and served it over zucchini noodles. This recipe turned out very good. The meat was tender enough for my dad, who wears dentures. I made this but not in the oven. I did it via slow cook in a cast iron pot. i added red wine plus I added corn starch to thicken the sauce. I served it over rice and it was fantastic! !